We recommend current WNP Series alternatives. Cool circulating water has greater heat-removal capacity than warm ambient air. KOOLTRONIC Water-Cooled Air Conditioners are recommended for applications with extreme ambient temperatures and/or severely contaminated environments, if a reliable supply of cool, clean water is available. Since ambient air is sealed out of the air conditioner as well as the enclosure, no contaminants can enter and there are no filters to clean. These units contain a regulating valve that automatically adjusts the condenser waterflow rate for water temperature and/or cooling load changes. When the air conditioner is shut off, the valve closes, cutting off the water supply to the unit. Should the water supply become inadequate for any reason, the built-in Excess Pressure Control senses the increased compressor discharge pressure and turns off the unit. For added protection, the switch must be reset manually after the waterflow problem has been corrected. 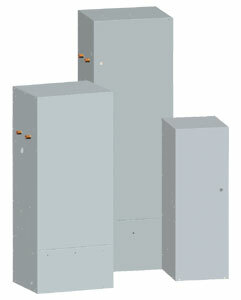 Sized interchangeably with the TrimLine Air-Cooled Panel-Mounted Series, these units can be installed either fixed or hinged to any vertical enclosure panel or door. They retain the closed-loop design and gasketed mounting features, to seal out contaminants and protect the electronics. CFC-free R134a Refrigerant is used in all WNP Series Air Conditioners.